The great and wise Chen Heung wrote the original manuscript that teaches a warrior the hidden arts of Choy Lee Fut. A great demon has made its way out of the deepest chambers of hell and stolen the manuscript. As an apprentice in these fine arts, you must first train in using your fists, and then weapons. You are also influenced by one of five animals that determines the scope and skill of your attack. This is a beat-'em-up with a difference; you train first and then move on once your master is pleased. The visuals are detailed, colourful and well animated, with sparse in-game effects. 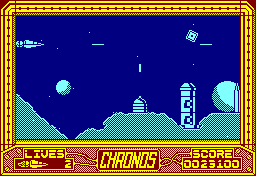 This is a horizontally scrolling shoot'-em-up located on the planet of Chronos. 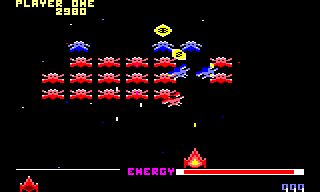 The aim of the game is standard; shoot the enemies approaching you and avoid crashing your spaceship into the landscape. There is a range of enemies on each level and some of them aren't easy to avoid, but the game itself is rather slow and boring, and the monochrome graphics only serve to add to this. The sound effects are nothing special either. 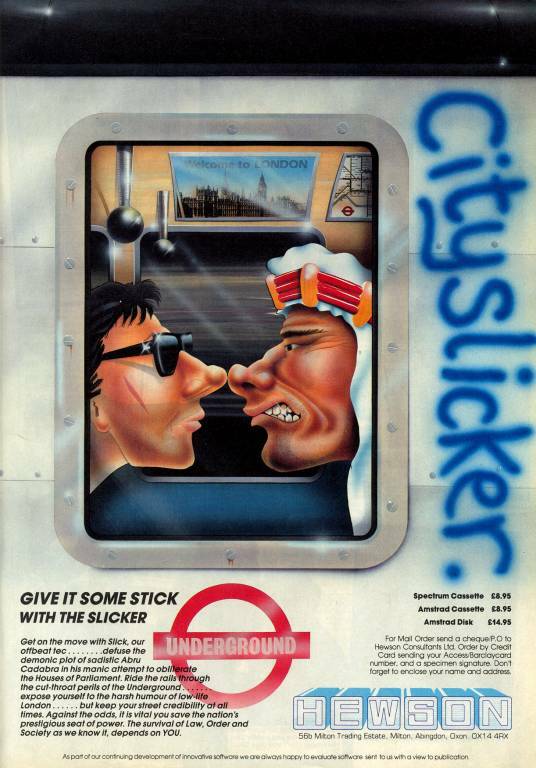 The team behind this mediocre platform game based it around a traffic warden who made their lives a misery – really! Playing it made me miserable as well. You control Chubby Gristle, the fat traffic warden, and you must collect as much food as you can before dinner time. The main reason why I don't like this game is that it totally lacks any semblance of originality; it's just another collect-the-objects platform game and has no merit at all. 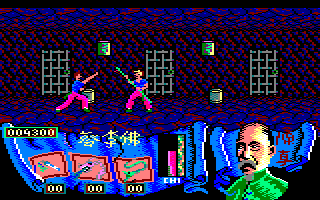 Neither the graphics nor the music are anything special, and it's too difficult, as well as being dull. This is one of the all-time classics on the 8-bit machines; if you've never played this game, you don't know what you're missing! You basically have to collect all the eggs on each level within the generous time limit, and also avoid the blue flamingo-like birds – they are flamingoes, aren't they? The idea is rather simple, and the graphics may not be state-of-the-art, but remember the saying, "graphics do not make a game"? This is certainly true for this game; it's amazingly addictive and fun to play. See also: Chuckie Egg II. 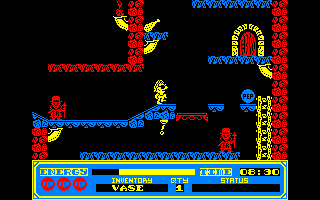 Unlike the first episode, this game looks and plays much more like Jet Set Willy. There are many objects to collect and to use to open doors and solve puzzles. The rooms are more open than in the initial game. The game area is huge, with many ladders and stairs to climb. Visually, unfortunately, there hasn't been much change. Chuckie is really tiny and his world is nearly colourless. The gameplay is rather good but it's difficult to avoid the numerous traps and animals that patrol the rooms. You must be pixel-perfect to have a chance to see more than three or four screens. Rodrigo Díaz, a gallant knight also known as El Cid, is searching for a scroll that contains a spell with the power to unleash Satan's hordes. You control Rodrigo, and you must find the scroll and give it to two men of pure heart who can neutralise the spell. However, you must find your imprisoned wife Doña first, and then you must find three other objects – a lamp, a bag of gold, and a key. There are lots of enemies to battle, which will reduce your energy and strength. Your energy can be replenished easily, but you can't replenish your strength until you find Doña – and as there are so many enemies to fight and she is a long way from your starting position, reaching her is very difficult. 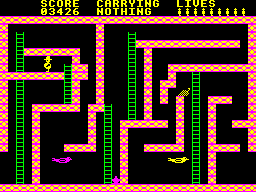 The graphics are lacking in colour and the sound effects are poor, and the game lacks variety. It's time for the annual police race through the streets of San Francisco. 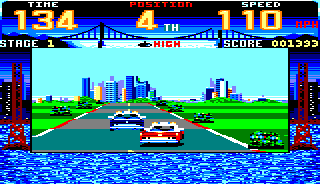 It's a standard racing game where you must beat the clock and reach the next checkpoint in time. You've also got to avoid trams and cars which might block your way. However, this is almost impossible to do, because the collision detection is truly abysmal; you often find yourself colliding into invisible police cars and trams that are on the other side of the road. As a result, you soon run out of time and can't reach the next stage. Steer clear of this game! A bomb has been planted in the Houses of Parliament by the dastardly Abru Caddabra and is due to blow up at midnight! As the hero, Slick, you must assemble a device (the BDU) to defuse the bomb. The parts are scattered throughout London and you have to use the Tube to get around, and you must also watch out for Abru! To be honest, the game is rather dull and also too difficult. The graphics are bad, the sound is even worse (and you should hear the imitations of Big Ben's chimes), and the controls are much too awkward. Another take on Will Crowther and Don Woods' Adventure, this is a faithful retread of the classic treasure hunt as you look to make your fortune and fame from the contents of the mysterious Colossal Cave, inhabited by all manner of creatures including elves, trolls and even pterodactyls. As you would expect with such a faithful retelling of a classic, the puzzles seem familiar enough to be not too daunting in the beginning. The difficulty curve certainly ramps up as the game progresses, but this is still a fine entry point for any curious adventurers. 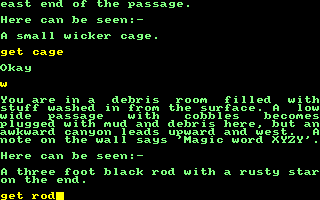 The text is clean and crisp with no graphics present at all. Comparisons with Level 9's version (Colossal Adventure) are to be expected and are unavoidable, and while it's not on a par with Level 9's game, this is still a decent effort that does nothing wrong but finds itself trailing in comparison. Space Invaders takes a slight twist, as rather than staying in formation, the aliens can now swoop down on you, making life that bit more difficult. Unfortunately, several of them have a go at the same time, leaving you with little room to manoeuvre out of a hail of bullets. There is one useful facility, in that the bullets you fire align themselves as you move the ship left and right. Despite the colourful graphics (and a pretty good explosion), the fun wears thin, as all the levels are exactly the same. See also: Classic Invaders, Classic Muncher.